A lovely, neat, great walking colt by gun sire Brazen Beau out of a Commands mare who is a half sister to multiple stakes winner Cameo & hails from the family of popular stakes winner, Hot Snitzel! This colt was purchased from the 2019 Magic Millions Sale and is paid up & eligible for the rich Magic Millions Race Series! Brazen Beau is a son of leading sire I Am Invincible. 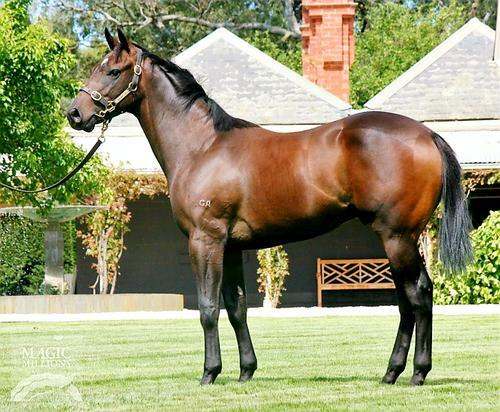 A winner of stallion making Group 1 races the Coolmore Stud Stakes & the Newmarket Handicap, Brazen Beau has made an immediate impact in the Magic Millions sale ring and on the race track, having already produced the likes of stakes horses Tassort & Ascension. Well related Commands mare Pavonia, is a half sister to multiple stakes performer Cameo – winner of the Group 3 Keith Nolan Classic & the Listed Scone Cup. Pavonia also hails from the family of successful international sires Iffraaj & Cape Cross, as well as popular stakes winner Hot Snitzel. He is bred on the same cross as Group winners Invincible Star & Fiesta! We purchased this horse from Rosemont Stud who have bred and sold Group winners Santa Ana Lane & Hey Doc! Current Status: Currently being broken in at Bimbadeen Park with Shane Rose. Progressing very well to date. Comments: 'Very much in the mould of his sire Brazen Beau. He is the ultimate professional when parading. He has a great action, appearing as though he ‘floats' across the ground when walking. A beautiful bodied horse who has everything in the right place. Gary Portelli went on to say that he very much reminds him of Elite's multiple stakes winner & Magic Millions sprint victor, Straturbo'. He will be trained by Golden Slipper winning trainer Gary Portelli. Pre-sale x-rays and scope were performed by Dr. Brett Warren. This colt was found to be low-risk. A post-sale examination of the horse was also conducted and the report has been included in the partnership agreement. Shares will be sold in 2.5%, 5% & 10% increments. The share price of $4,950 per 5% share is inclusive of all sale expenses, breaking in & education cost, lifetime Magic Millions race series nomination, initial Golden Slipper and Golden Rose race nomination, death & mortality insurance and all related registration and Racing NSW syndicate fees until June 2019. Average upkeep for a 5% share is $50 per week over the course of the year. Further details on cost, communication & owner privileges can be found by clicking the 'FAQ's' link below. Hello, I'd like to know more regarding the horse 'Brazen Beau X Pavonia Colt' you have listed as available.